Review: 55 Days, Hampstead Theatre. The 55 days are those between the establishment of the Rump Parliament and the regicide of Charles I on 30 January 1649. As far as I can tell, apart from the meeting between Cromwell and Charles I on the eve of his trial (acknowledged as being fictitious in the programme), most of the history stacks up, so metaphorical liberties have not been taken. Not only that, the production deftly explains the issues and the dilemmas facing the king’s enemies without being overtly didactic or preachy. Hence, if you’re a bit vague on how it was we came to overthrow and execute our king, this is a very entertaining way to find out. The play takes a conventional pro-Parliament position, and Cromwell’s part is extremely sympathetic. But unless you’re a fervent Charles-as-martyr advocate, it’s not much the worse for that. The leading players in the drama are also characterised conventionally. And they’ve been cleverly chosen in a way so as to demonstrate the various positions and potential courses of actions by Parliamentary factions. Charles Stuart the king is narrow-minded, aloof, sneaky, intransigent. John Lilburne is a dyed-in-the-wool, goggle-eyed, dangerous extremist; Thomas Fairfax is avuncular, kindly and moderate. 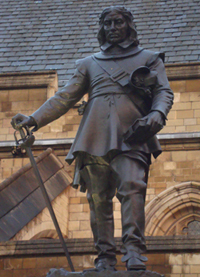 And Cromwell, as mentioned, is portrayed as a sort of wise super-hero with the world on his shoulders and everybody else’s problems to solve. This is the only real criticism I have. As we know, like most of his colleagues, he was no democrat, but this was only hinted at. His faults need to be writ large too in order to counterbalance Charles, to prevent him descending into panto-villainy. But on the plus side, Cromwell was shown not to be a prig either which, as far as I know, has substance. The second half of the production is mainly dedicated to the trial. 18 “commissioners” cobbled together to stand judgement over the king. Illegally. And yes, the play did acknowledge this quite clearly, mainly from the lips of the king himself. Charles is somewhat transformed from the delusional, dismissive dandy of Act 1 into an imperious, courtroom tough and not entirely without a case, a case he presented strongly, putting his enemies into a bit of a lather, albeit temporarily. Drama, eh. All the actors are superb and totally believable. 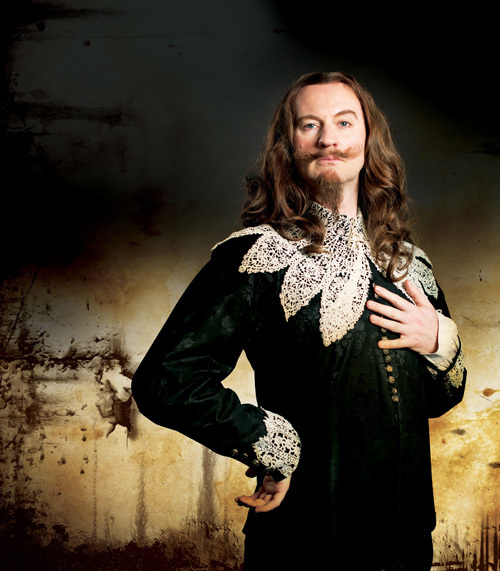 I especially like the way Mark Gatiss plays Charles with a slight Scottish burr. The auditorium for this production is configured so the stage is in the middle with seating either side. This works well, drawing the audience into the action. Costumes and props are firmly mid-20th Century. The Parliamentarians when on military duty are dressed in IRA chic, but when in civvies they don demob suits and sober ties, so the dull Puritan look is fully maintained. The exception to all of this is Charles Stuart himself, who throughout is dressed in contemporary kingly robes. It would have been nice to have seen him in a fabulous hat with an impossibly huge plume, but all the action is indoors. This mis-match of eras doesn’t jar at all, in fact it helps to emphasise the contrast between the two sides, the two positions, the fact that Parliament is the future and Absolute Monarchy is the past. The production is pacy and highly-charged throughout. I can be a bit of a nodder-off at the theatre, but 55 Days owned my full attention from start to finish. Excellent. 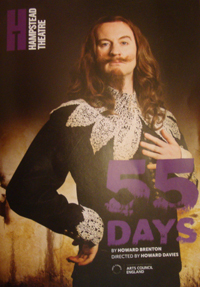 55 Days is written by Howard Brenton and directed by Howard Davies. It runs from today until 24 November, that is to say not for terribly long, do don’t miss out. More info and booking here. It is high time for me to put an end to your sitting in this place, which you have dishonoured by your contempt for all virtue, and defiled by your practice of every vice; ye are a factious crew, and enemies to all good government; ye are a pack of mercenary wretches, and would like Esau sell your country for a mess of pottage… Is there a single virtue now remaining amongst you? Is there one vice you do not possess? Ye have no more religion than my horse; gold is your god; which of you have not bartered your conscience for bribes?… Ye are grown intolerably odious to the whole nation; ye were deputed here by the people to get grievances redress’d, and are yourselves gone… In the name of God, go! And there are variations of the same. But we love it because it is such a great piece of rhetoric: powerful, insulting and amusing. More than this, one can apply it to the Commons at virtually any point in history since. There is a good article on the accuracy of both the quote and accounts of the dissolution here.